Get a grip, because I’m about to tell you how to double your money with no risk. While simultaneously bringing new meaning to the phrase, “go green”. Like me, I’m sure that many of your beer-drinking friends go on about the hundreds of dollars they ‘make’ by taking their crushed aluminum cans to be recycled. In these days of miserable interest rates on my savings account I figured it was time for me to see if this new income stream could improve my standard of living. Unfortunately I don’t drink beer in cans, since I’m mostly a wine and craft-brew guy. 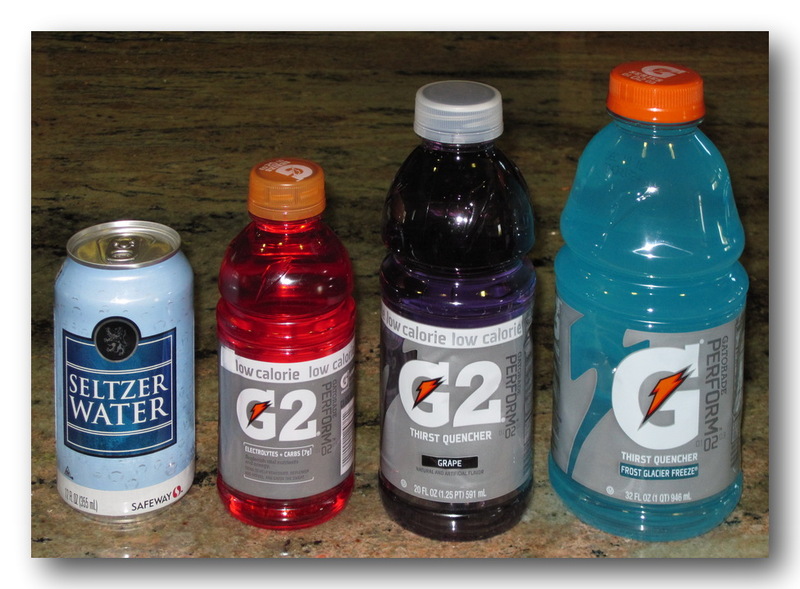 But we do consume some Seltzer and Gatorade, both of which come in recyclable containers. Bravo. After investing in, and religiously employing, a can-crusher for several weeks, I accumulated what seemed to be a ton of aluminum. Well, not a ton, but at least a few pounds. But when I delivered my load to be bought by the recycle guy I was crushed, crushed I say, by the meager payback. We are talking a couple of bucks for all that work and time. It seemed like I was paying a lot more for the aluminum when I purchased the cans in the grocery store than I was getting back in all my newly found green-ness. Convinced I was getting shafted by the authorities I almost called my local Tea Party, but instead of going for comic relief, decided to do some calculations. Keep in mind that in the grocery store we pay the CRV (California Refund Value) deposit per container, but get paid back by the pound of material we present for re-cycling. The CRV for all three containers is the same: 5 cents per container. The weight of 1 aluminum can is 1/2 ounce. The weight of 1 Gatorade 12 Fluid Ounce bottle is 1 ounce. The weight of 1 Gatorade 20 Fluid Ounce bottle is 1 1/4 ounces. The weight of 1 Gatorade 32 Fluid Ounce bottle is 1 3/4 ounces. 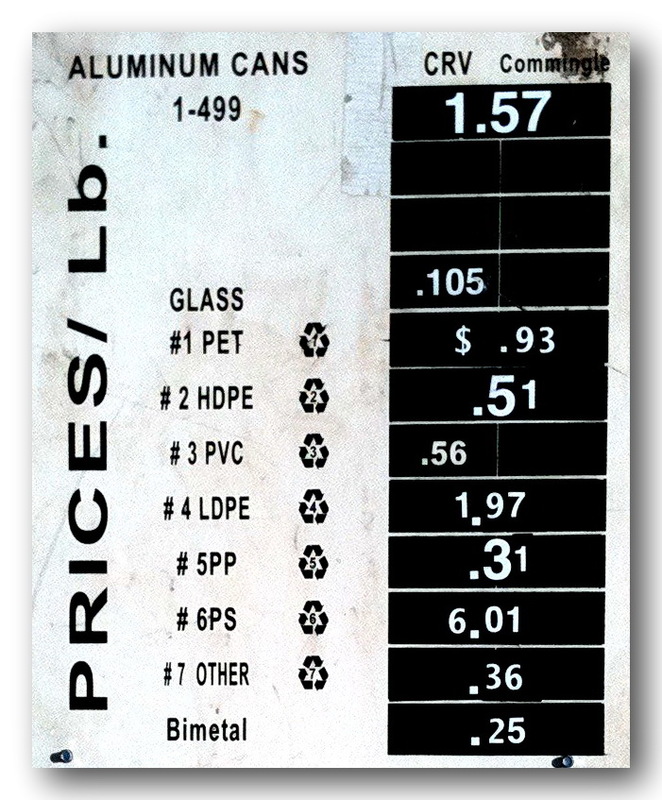 The recycle value of 1 pound of aluminum is $1.57 per pound. The recycle value of 1 pound of plastic is 93 cents per pound. 32 aluminum cans to make a pound. 16 small Gatorade bottles to make a pound. 12.8 large Gatorade bottles to make a pound. 9.14 extra large Gatorade bottles to make a pound. So where do we find our best Return On Investment? For each aluminum can, 4.9 cents returned, for a loss of 2%. For each small Gatorade bottle with cap, 5.8 cents returned, a gain of 16%. For each large Gatorade bottle with cap, 7.3 cents returned, a gain of 46%. For each extra large Gatorade bottle with cap, 10.2 cents returned, a gain of 104%. Our beer-drinking friends are actually losing money even after collecting their re-cycle fees. They are generously donating 2% of their CRV to the State of California, and not even breaking even. Thanks guys. On the other hand, those of us who work out every day, and drink Gatorade to replenish our electrolytes are not only happy and healthy, but if we supersize our investment to the Big Gatorade bottles, we will be making 104% on our money. F2U Rio Linda, that’s otherwise known as doubling your money. Oh, I discovered one more interesting fact. The State of California levies Sales Tax on the CRV, so when they increase the CRV evey so often it serves to increase their tax revenues. Maybe it really is time to call in the Tea Party-errs. Bob, you neglected to factor the super light weight water bottles from Costco. I think it must take twenty to equal one Gatorade bottle! So those of us who want to be healthy and like convenience are extra screwed. Maybe I’ll just start littering them out my window since they aren’t worth anything. I owe a debt of gratitude to you for this handiwork, Bob. I am a convert. Only the largest Gatorade for me from now on! I also find they make handy tent urinals, too. What could be better than making me money and allowing me a good piss at dark thirty? Heavenly. Maybe my reply may be slightly off a tangent to what you are trying to do, but I’ve been trying to minimize my money spent on sports drinks. And I think I’ve found the best deal so far. I just buy Powerade bottles because they are really durable and can be used forever. But I buy Gatorade G mixes. You can buy powder for 9 gallons for less than $10. It is a food item, and not in bottles so there’s no tax or CRV. That means it is 17 cents for 20oz of Gatorade. And it is better for the environment and your wallet. Good point. In fact I transfer the drink to a water bottle anyway, you can’t really drink out of the original container. And recently I found a new water bottle at REI which is a huge improvement over the one I had been using, which improved the quality of my workouts. You neglected to take into account that all containers 24oz. and over pay .10 in CRV. So the xl gatorade bottles are not the best investment. The 20 oz. ones are. A little story… I separate my gatorade bottles from my other recyclables and bring them in separately. One time the recycling attendant nearly refused to weigh my two large bags of gatorade bottles. Another time, it looked like he had his finger lift up the barrel ever so slightly while it was on the scale so it would weigh less. Couldnt prove it though. Maybe time for a sting operation. Lol. Well done, I stand corrected. And I will keep my eye on those attendants. I read at CalRecycle that you can request to be paid per-container to get back what you actually paid, but can only bring in 50 items per category such as; 50 cans, 50 plastic, 50 glass etc. and the recycling centers have to do it! I didn’t know that, thanks for the tip!